Contemplation is the practice of silent resting in the presence of God with roots that stretch back to the Old Testament. Da’ath is a Hebrew word used in the Old Testament to refer to experiential knowledge of God. Later, the Desert Fathers and Mothers used to the word theoria to mean both intellectual knowledge and this primary experiential knowing through love, or da’ath. When these writings were later translated into Latin, the term theoria became contemplatio, or contemplation. Contemplative practices are methods or disciplines that allow us to quiet down, attune to spirit, and open ourselves to the grace of contemplative prayer. What are some examples of contemplative practices? Examples of contemplative practices include Lectio Divina (read, reflect, respond, rest), Centering Prayer, the Jesus Prayer and Christian Meditation, the Examen, and others. How does contemplative practice bring about change? Contemplative practice constitutes an interruption of the perpetual motion faculty of the mind that feeds the ego and makes space for the divine presence; it provides a bridge from the False Self to the True Self. This cultivates a space of inner awareness uninfluenced by our habitual ego identity, like opening a door and letting air into a room. As we practice the presence, awareness, or what Thomas Keating calls heartfulness in a moment-to-moment basis, we truly see our own lack of awareness, our own petty ego patterns at work. Metanoia, or the inner turning has to do with entering into this open awareness, and leaving behind the small egoic mind of the false self. This degree of spiritual awareness is expansive; it is both inward – recognizing our own mind-ego energy at work and dismantling its programs through recognition, and it is outward – recognizing the True Self or Divine Spark in others in their inmost being, seeing through the surface behavior that grows out of lack of awareness, or the same illusions of satisfaction or “programs for happiness” that we have fallen prey to time and again. Empowered through the grace we’ve experienced, we can extend that grace to others, making room for transformation. What is the purpose of contemplative prayer and practice? Contemplative prayer draws us ever deeper into the presence of God as we move through the stages of acquaintanceship, friendship, and intimacy in divine union. This occurs to the extent we are able to empty ourselves of our habitual ego dynamics and open ourselves to the divine reality that is at all times and everywhere present (John 8:58). The theological term for this state of intimate union with God is theosis (John 10:30). Is the contemplative path a way to happiness? Instead, we think of it as a way to truth. This is not a propositional, pre-determined truth, but a dynamic, receptive, moment-to-moment experience of truth-in-action. Alignment with this kind of truth brings periods of deep joy, a better term for this state of being than happiness, which is contingent upon maintaining a certain state or connection to certain attachments and fulfillments. The contemplative path brings about an inner state of non-resistance, and then we are free to be transformed and act in the world out of rootedness in divine love rather than our misperceptions, conditioning, and egocentrism. A word of caution: contemplatives experience both peaks and valleys. Since a good deal of the contemplative process involves being stripped of ego defenses, this can be a volatile and vulnerable process as we open ourselves more and more to the divine presence. There is pain involved in this process, but also profound joy. What are the characteristics of the contemplative life? Are there different levels of the contemplative life? We prefer the terms “stages” or “phases.” In general terms, contemplatives describe moving through five stages along the contemplative path. First, we have an experience of Awakening, usually a temporary suspension in our separate self-sense, and we experience a deep but temporary oneness with God and creation. The traditional self we identify with no longer constitutes the totality of our felt “self.” After this experience of the absolute, we begin the more arduous process of self-emptying. The next stage along this path is Purgation, or learning more deeply healthy disciplines, teachings, frameworks, and language to help guide us along this path. Here, we build positive habits and community. The next stage of the journey is that of Illumination, in which we have the hidden parts of our self illuminated, laid bare, our suffering, our reactionary nature, our protections, our exclusivism, our small egos, our False Selves. After a time in this stage, usually several years, we move to the next stage, the Dark Night of the Soul. In this stage, we feel all our striving has been for naught. Every attempt at self-improvement, every hidden ambition or secret striving, every attempt to make ourselves feel righteous or safe or other than or better than is laid bare. We feel stripped and exposed. This is the final burning away of the attachments or obstacles to the presence of God in divine union, where we become our True Self in the fullest sense, simultaneously aware of our actions and presence in the material world of form and of the transcendent divine reality beyond form. Is there scriptural support for contemplation? Jesus of Nazareth was the archetypal contemplative, of which all later Christian mystics and contemplatives are an after-echo. In all practice and teaching, the Christian mystics and contemplatives seek to bring about openness of the inmost self to the awareness of the divine presence of Christ. When we awaken to this reality, we recognize that Christ is the quality of being that is more and more available the more we allow ourselves to go through the refining process of self-emptying or kenosis (Philippians 2:7). St. Gregory, a sixth century contemplative, describes contemplation as the knowledge of God impregnated with love. For contemplatives, this experience the fruit of reflection on the word of God in Scripture. In this “resting in God,” the mind and heart are not so much seeking God as beginning to experience or to taste what they have been seeking. This doesn't refer to the suspension of activity, but the reduction of our many acts, thoughts, and reflections into a single act or thought to sustain our consent to God's presence and action. Is Contemplative Light a Christian organization? We are an ecumenical interfaith organization. We draw on the Christian contemplative tradition, but informed by all three points of the triangle of faith, including Scripture, Tradition, and Experience. I’ve heard that contemplation is dangerous. Should I be worried? 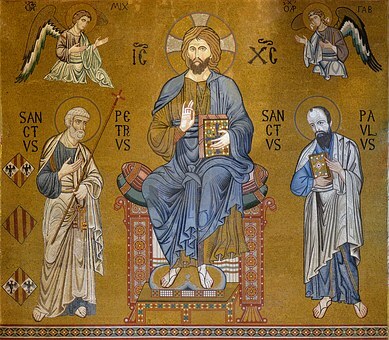 Christian tradition traditionally distinguishes between discursive or spoken prayer, meditative or reflective prayer, such as imaginative participation in the life, teaching, or sufferings of Christ, and contemplative prayer, or a time of silence in which we make ourselves available to the Mystery of God, and allow His action and presence within. Contemplative prayer is intended to be a complement, not a replacement to other forms of prayer and inner transformation. Although some are called to contemplative prayer early in their journey of faith, in our experience, there is a time of growth, learning, and maturation before people come to a place of spiritual dryness and limitation of old ways of knowing. They enter the desert or wilderness, often after a time of crisis. In such a period, some are called into a new dimension of faith through contemplative prayer and practice. There seems to be a degree of necessary suffering before being called to a life of contemplation. We believe all creation is saturated with divine love. Our False Self, our fallen self, or “sin nature” is what keeps us from realizing the nearness and presence of God. During our formative stage of faith, although we may build strong foundations, this False Self usually stays largely subconscious. As we enter into the contemplative stage where we encounter the God beyond the one we have imagined or conditioned to accept on authority. There is a danger in being stripped away of false certainty and combativeness. There is a danger to our constructed identity. There is a danger of losing your old self in God. Contemplatives understand that the spirit blows where it wills. We are less interested than most institutions in systematic theology and predetermined answers. Nor do we believe in abstract predetermined identities. There is no mold for your True Self, a dynamic being open to the movement of the spirit. How do I know if I’m ready for the contemplative life? As we move along the stages of spiritual maturity we have different relationships to community and authority over time. If you still feel a strong need for a mediating authority figure or group to help provide much needed accountability and discipline for your spiritual life, this may not be the time to move into the contemplative stage. You may still have a need to internalize more conventional ways of spiritual community and practice before you are ready. In the Old Testament, the role of the biblical priest was to help the community abide by the law. This is the childhood stage of development when we still need a parent figure to help us learn (Deuteronomy 8:5). But there was also a small group of prophets who operated outside the traditional religious structures and brought His truth directly to the people and figures of power in both politics and religion (Hosea 2:19-20). They were at a different stage of development, discerning God’s presence and will directly, without a mediating authority figure. Why are some Christian groups suspicious of contemplation? Traditionally, Western spirituality identifies God as an object outside the self. Conventional theology holds that in accepting the death and resurrection of Jesus and following God’s commandments He fords the giant chasm between the human and the divine, adopted into God’s family and granted eternal life. The contemplative often has an awakening experience realizing that the self is and has always existed within God. But we usually return to the level of relative everyday awareness and the contemplative journey is about letting go of the obstacles to that degree of awareness moment-to-moment. As spirits-in-process we are all at various stages of insight and development on our spiritual journey. Our stages along the path include cultural conditioning, our current level of understanding, and our personal experience. One of the most difficult aspects of ourselves to change is our unconscious assumptions about ourselves, others, and God. In general terms, the first stage of our journey is egocentric. We’re out for ourselves. This is a common criticism of our materialistic society. Generally, the second stage is a sociocentric one. We learn there is more to life than ourselves. We learn to adopt the values of a group and to contribute to its well-being. This second stage of development is where many people of faith find themselves today. The next two stages of development include the worldcentric and the kosmocentric view, or the understanding that we are inherently interconnected to all beings, all life, all creation. For those used to thinking in terms of the survival or triumph of their own group or tribe, it usually takes some sort of crisis or destabilizing event – on the contemplative path we call it an ego death (one of many necessary for movement along this path) to move our center of gravity from one stage to the next, though we may have a brief foretaste of one of the later stages without experiencing a life shift. Whatever group we identify with, whatever ego games we’re used to playing, whatever our favorite Scriptures or communities we cling to for certainty, stability, and comfort are threatened by contemplation. No structure is safe from the penetrating gaze of God, no identity. Whether our egos clings to the identity of billionaire, megachurch pastor, or even that of parent, eventually God strips us of our self-concepts and self-illusions. Beyond the temporary clothing of convention, conditioning, language, and concept, what “self” is left? The answer to this is part of the contemplative experience, and part of what God walks us through on our spiritual journey. Without undergoing the seismic shift we experience in the process of Awakening to the presence, many of us remain in adolescent stages of faith like James Fowler’s mythic-literal and synthetic-conventional stages.